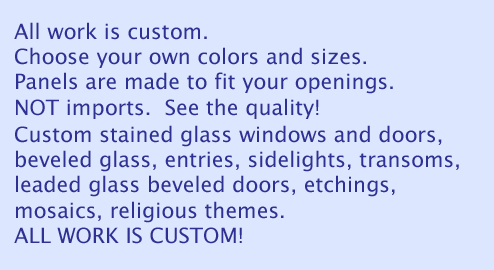 "C4S" LEADED VERTICAL GLASS SIDELIGHT WINDOW CUSTOM AT GLASS BY DESIGN. This tall, thin leaded glass sidelight window was 10" x 70". The C4 "bevel set" is 7–3/8" x 6–¼". This custom leaded glass sidelight window had two C04 bevel sets and a beveled star in the center.